Some Ice with Your Wine? Before bottling a white wine there are a few things that you have to do to get the wine ready. 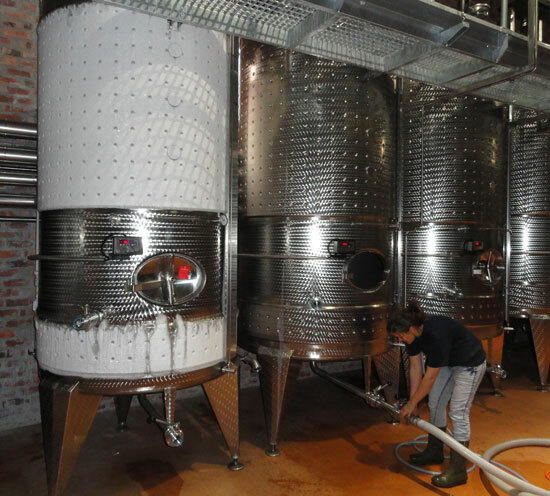 One of these is to make the wine Cold Stable, which means we take the wine’s temperature to just below 0˚C. The wine won’t freeze at this temperature, because of the alcohol, but it ensures that all the tartaric acid in the wine will crystalize at this temperature. The reason we do this is that it prevents the forming of crystals inside a bottle while being chilled in a refrigerator. When making the wine Cold Stable, a thick layer of ice forms around the stainless steel tank where the cooling jackets are. It’s quite a sight!